Ruggedly handsome in its own way with glorious desert charm. Mesquite trees are short, twisted Sonoran desert plants and the resulting lumber reflects the intense hard life they endure. Expect a surprise collection of knots, splits, worm holes and bark pockets you can feature in your own one-of-a-kind custom projects. Freshly cut mesquite is medium tan and ages to a reddish sun-baked sandstone color. - Assorted widths 3" to 8"
In an effort to make buying lumber easy and convenient, we offer these packs with a fixed quanity of lumber. It's your choice of 10, 20 or 100 board feet, and each pack has a flat rate shipping charge if shipped to any location east of the Mississippi River. The charges only apply to the products called Craft Packs, Project Packs and PRO Packs. 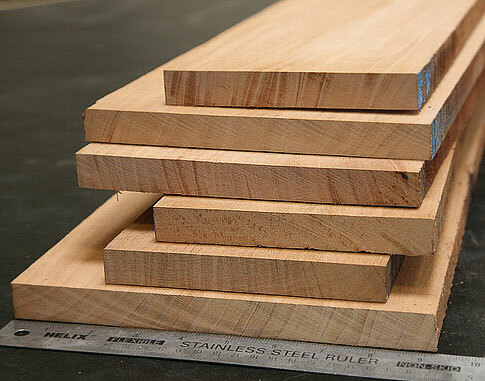 Mesquite lumber pack comes with an assortment of widths and lengths. Also known as 4/4, S2S. Surfaced 2 sides (S2S) to 13/16" actual thickness. May still require you to flatten, plane, shape or sand your project parts to fit your project. Learn more in our blog: "What Does 4/4 Mean in Lumber?" This is the range of widths that are usually available in this pack. You get a variety of lengths with the ends trimmed. Here's the perfect assortment of boards for your small fine woodworking projects, or when you want to try just a little bit of this wood! A 10 board foot Craft Pack is simple, plus we stand behind it with our 100% satisfaction guarantee. It includes a great mix of boards that total 10 board feet of hand-picked lumber, and you'll get a fantastic assortment of sizes: from 3'' to 8'' wide, and 24'' to 48'' long. All boards come surfaced on 2 sides (S2S) to 13/16'' thick, you can choose to have the boards planed down to a different thickness if you want thin lumber. Padauk African Turning Squares: 1-3/4" x 1-3/4" x 18"
Rich dark brown heartwood with wavy darker lines. This is a small, twisted, short-trunked tree, 20 to 50 feet high, or a large shrub. It is very slow growing, ill-shaped and scrawny looking tree with an exceptionally deep tap root. You have a lot of ways to buy this wood! Mesquite Turning Squares: 1-3/4" x 1-3/4" x 12"
Factor in enough to work with! You'll want to arrange grain patterns, sort color, fix mistakes, run test cuts, make finish samples, etc. Lumber comes in random widths and lengths. If you need special size considerations, please let us know by using the "Minimum Size Request" box in the order form or by confirming your needs by phone or email. Expect your final amount of footage to change slightly. Buying by the board foot is an exercise in estimation, therefore we don't know the precise amount of footage you'll receive (and be billed for) until we physically select the wood for your order. We want to get your order right! So we may need to contact you for clarification. Please use a good phone and email during checkout. This is the unit of measurement for hardwood lumber when it's bought/sold in random widths and random lengths. Board footage is a measurement of volume, and it's abbreviated Bd. Ft.
One board foot is equal to 144 cubic inches. What Does 4/4, S2S Mean? It's a fraction that refers to rough (RGH) sawn thickness of lumber, and it tells you approximately how many quarters of an inch make up the thickness. Surfaced lumber is thinner because it started out as rough sawn but it's been planed smooth. Planing removes thickness. Unless otherwise specified, our lumber is "Surfaced 2 Sides" or S2S for short. Check out our article if you want the full explanation. Enter requirements into the order form where it says, "Minimum Size Request"
You will cut and/or join your material to create the finished sizes you need. We'll pick out wood that will give you enough to do that. For this reason, the final amount of footage you receive in your order will be slightly different, and your final billed charge will be different. If you want to only buy pieces of an exact size, that will be sold differently. Please contact us for a custom quote. Can I Get 100% Clear Wood? Sadly, wood cannot be 100% guaranteed to be clear on both sides all the time. Most of our lumber is graded "Select" and better, which means it's at minimum 83% clear on one side. The order of Mesquite==10 board feet--arrived on time and in fine shape. And the stack of mesquite boards--I could not have asked for more. Better than expected, even better than Woodworkers Source had promised. Excellent service and product. Have not started any projects with this wood yet. My plans are to fill the crack with different colored powdered stone mixed with some 2 part resin. What's 4/4, 8/4, 12/4, etc.? 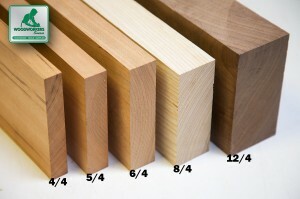 Understanding hardwood lumber starts right here with these wacky fractions. If you're expecting perfect clear lumber 100% of the time, you're in for a surprise. Here's a summary of the hardwood lumber grades and what to expect from them. Board feet isn't your everyday kind of math, but these three simple steps make it easy to figure out your project. Here's a handy (and free) Excel worksheet that helps you estimate the lumber needs for your project. Are woods poisonous? Hazardous to use in cutting boards or baby cribs? Find out here. Wood is like a sponge, and it's always in a state of absorbing or releasing moisture to stay equalized with its environment. The problem with that is it also swells and shrinks. Here's what you need to know to protect your project. In short, you may receive slightly more wood than you order and be charged for it. But don't worry, this is usually no more than a fraction of a board foot, but we do need to charge you for exactly what you receive. Why? Because the amount of wood you buy is largely dependent on the sizes available in the lumber pile. We will always do our best to ship you what you order, though. If you order 2 board feet of a wood, the board we may need to ship you could be something like 4/4x6-1/2"x49". That's actually 2.21 board feet, and that's what you will be charged for. Shipping Costs also will be adjusted to reflect the actual quantity we're shipping you as well. We we want you to be happy with your order and our service! So if you still have concerns about what you need and what we can do for you, please call to discuss. Due to the limitations of website software, it's best to handle this type of order person-to-person. Lumber comes in various widths and lengths, which is why sizes and final board footage must fluctuate, and this is why you may need to buy more footage than you realize. The stack of mahogany above shows how lumber comes in many widths, rarely uniform. Figure out how much board footage you want to buy. Be sure you figure enough so you can arrange color and grain, work around defects, fix mistakes, etc. Tell us your minimum size requirements or other needs in the "Minimum Size Request" box in the order form. 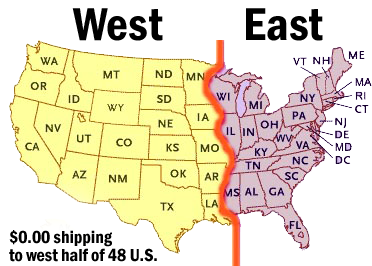 There are some shipping restrictions on length. Please see the "Sizes" section below the product images. A board foot (bd. ft.) is the unit of measurement for random width, random length lumber. Longer lengths can be shipped truck freight, but this method is usually economical only for shipments that are at least 350 lbs; Please contact us to get a custom shipping quote if you need lengths longer than 7'. Take how you feel about the usual lumberyard and throw it out the window. Doing business with Woodworkers Source is better. Simply stated, we really want you to be happy with what you buy from us. That's why we stand behind our lumber, wood, veneer, and turning stock with a 100% satisfaction guarantee. If you're unsatisfied we want to know so we can fix it. Yes, that's an awfully expensive proposition -- that's exactly why we work hard to get it right the first time by asking you questions about your projects, being careful with hand selection, and being mindful that you're putting your trust in us to pick out great looking wood that you'll be proud of. Your order gets attention by a real person who selects your wood, one piece at a time, and whose goal is to make you happy that you chose to do business with us. That's the way we've done it since 1998 when we first started shipping hardwood lumber to woodworkers all over the world. We believe that hand selection is our magic ingredient. Because of that, we'll also stand behind your order with a 100% satisfaction guarantee. If you don't like the wood you receive from us, we'll replace it. We can take photos of any of our lumber and send them to you by email, text, or any method you prefer. We'd like to empower you to make decisions and we can make informed suggestions based on your project and your tastes. Call or email us. The members of our crew are woodworking hobbyists too, so they get to know many of our woods by working with them. When you call or email, you'll talk to a friendly fellow woodworker who understands your concerns and, more importantly, is willing to help. Woodworking is a very broad topic, and there's no one who knows it all. But fortunately we have a staff of people who each have knowledge of different specialties. So if the person you're speaking with doesn't know the answer, they'll find someone who does. Hardwoods come in various widths and lengths because it's in raw form as it was sawn from the log - it's not sized to any standardized dimension yet. This is why lumber is measured by the board foot, and why you may need to buy more footage than you realize. The stack of mahogany above shows how lumber comes in many widths, rarely uniform. How Do You Get The Sizes You Want? Cut and/or glue your pieces to size in your own shop. When you order lumber from us, you can use the "Minimum Size Request" box on the order form to let us know what your minimum requirements are, or what you want to be able to create. That means, we'll pick out boards that will yeild what you want. We can also do custom cutting for you. Contact us for a quote. What if I Need Specific Sizes? Do You Have Woodworking Tools? 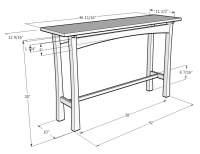 If you've got a table saw or other woodworking tools, then you're in the right place! Buy some lumber, then cut and/or glue your boards to make the sizes you need. Use the "Minimum Size Request" box to ask for boards to be a minimum size. We'll select boards that are larger so you can cut them down. Contact us for a custom wood cutting quote. In woodworking, you do your own cutting and gluing so that you can finesse your project together just the way you want. Fortuntely, if you have the tools to cut, shape, and manipulate wood, you can create the sizes you need. What Is a Straight Line Rip? All of our lumber is stocked surfaced on 2 sides - which means the face and back of the boards are good and smooth and the edges are rough sawn. A rough edge is rarely suitable to be guided against a table saw fence. A straight line rip puts a true edge on the board so you can run it against a table saw fence and cut the width you need. A straight line rip is also performed after measuring the board. The rip will remove 1/16" to 1/8" from the width of the board. Minimum Requests are $1.00 /bd. ft.
What we do is select wood to exceed the dimensions you need - that way you can cut it down to what you want. This selection fee is not the same thing as a cut-to-size fee (see bottom). For example, if you request a minimum of 4" wide, you will receive boards that are wider than that. You will be able to yield 4" widths. Likewise for length requests. You'll receive boards that are longer than your request. The boards we select may compute to more footage than you anticipated. You will be billed for the actual footage that we ship. We always contact you first to discuss and make sure you get what you need and are not surprised by additional charges. Please be patient. Selecting wood takes time to do it right. Looking for material to meet your size demands will add to the amount of time it takes us to pull your order together. But we promise to do it right, and to do it well. 5. Do You Want To Order Exact Sizes? No problem. Please call or email us to get a custom cutting quote. We'll be happy to help. Due to the limitations of website software, we can't provide a price for custom cut wood without discussing with you first.